The VLCD Series is the LCD based replacement for the out-of-production VEM Series High Resolution Monochrome Variable Line Rate Video Monitor. 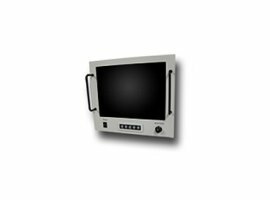 The VLCD Series are variable line rate (multi-sync) video monitors, and like the VEM Series, will display high resolution 875-line signals, not only in monochrome, but color as well. The NTSC/PAL composite video input signals may also be displayed in monochrome or color. Designed for use in a lab or ground benign environment, the latest TFT technology with LED backlighting provides high-resolution monochrome and color images with high brightness. Convenient front panel ON/OFF and Brightness controls, along with the on-screen display (OSD) menu controls, provide for complete control of all monitor functions, in addition to user-configurable hot keys. A full line of accessories and options are available, including 19" rack mount kits.